Awkward, huh? Even if your character does like using big words or has a know-it-all way of expressing himself/herself, it’s probably best not to overdo it. Your readers may get sick of reading pages of that gibberish. Or they may get sick of your character altogether. But writing good dialogue doesn’t always mean writing simple sentences. It just means writing the way your characters would speak. In Artemis Fowl, by Eoin Colfer, Artemis Fowl is a twelve-year-old criminal mastermind. The way he speaks is much different from the way an ordinary twelve-year-old speaks. When I’m writing dialogue, I like to picture myself as the character I’m writing about. I put myself in his/her mind. It also helps a lot to read aloud what I’ve already written. I speak with the same tone and inflection as I imagine my character would. If anything sounds unnatural, I know I have to change it. If the dialogue in your story isn’t believable, it creates a distance between the characters and the readers. It’s harder for the readers to care about your main character because they can’t really identify with him/her. Another great way of knowing whether your dialogue fits your characters is to get feedback. Don’t defend your work – just let the people reading it tell you whether it is believable or not. Good dialogue shapes who your characters are just as much as descriptions of your characters do. Whether a character speaks in short, choppy sentences or long, wordy ones makes a difference. In Anne of Green Gables, by L. M. Montgomery, Anne loves to talk. She loves using big words and imagining things, so her sentences tend to be long ones. Basically, it all comes down to this: True-to-life dialogue is not just important, it’s necessary if you want to tell a good story. It makes your writing stronger, and it shows us who your characters really are. First off, let’s pretend that it has only been two days since my last post. All right. Now that that has been established, let’s continue. So I read this book a while back, and it really made me think. About life. 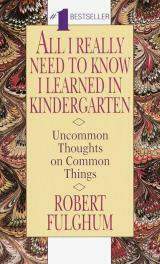 The book is a collection of short essays by Robert Fulghum, and he basically sends the message that all we really need to know we already learned in kindergarten (surprise!). But in all seriousness, it’s kind of true. We learned to play nicely, share our things, clean up our messes, etc. And even though I don’t agree with every single thing he writes, I do agree with most of it. Honestly, if more people could remember the things they learned in kindergarten, the world would be a better place. If politicians could learn to play nicely, if presidents could learn to clean up their messes, if people in general would just say “please” and “thank you” – what a world of difference it would make. Aside from the content, I just loved Fulghum’s writing style. I felt as though he was right there, talking to me. I think that’s what made it so enjoyable to read. One of my favorite essays that he wrote was about crayons. Crayola crayons, in particular. All the different color names – seriously, razzle dazzle rose? – and whatnot. There’s just a certain pleasure that comes from scribbling with crayons. And Robert Fulghum captured it perfectly. During finals week, I spent much of my time coloring with crayons. I just brought my crayons to school, and my friends and I had a fine time coloring. There’s just this joy, this childlike satisfaction, this relaxing feeling that comes with a box of crayons. It’s included in the package. Free. Look at the “magic scent” ones too. I mean, really, can you believe there are crayons that smell like leather jackets?